Taking it from the Rear! Soke; Anshu Christa Jacobson teaching Street Survival and Self Defense at Hombu Dojo. Everyday I teach students kata and waza that has been passed down for centuries within the Nana Musha Den (7 Warrior Traditions of the Budo Ryu). I also stress that kata is a form of strategy and should not be looked at as law. One should look at the strategies and principals of the kata and then apply this to many other situations that can arise from any form of mental, physical or emotional attacks; this is the essence and truth of goshinjutsu. When training with kata, one of the training drills that I have my students do is to execute the kata from all angles; from all 10 directions of the Happo-sabaki (4 directions (+), 4 directions (X), 2 directions (Tenchi / Heaven and Earth; Up and down). The general rule of thumb in street survival that my father told me years ago is this, “It is what you don’t see, that will kill you”. Simply put; know your surroundings, understand the terrain and what can and cannot happen every time that you go somewhere. Know the shoes and clothing that you wear and how you can move in and out of them! Ladies if you are like me, I wear high heels everywhere I go all of the time (yes I do, don’t judge me J) how fast can you get out of your heels, do you practice that? ; and if not why? ; you should! I can pivot 180 degrees in platform high heels and get out of them to get my feet stable on the ground in less than a second; and even of you don’t wear heels all of the time, only on special occasions, you still should be able to do this, because a threat is not going to happen when you expect it! They are predators and you are their prey and when you let your guard down, that is when they will attack! How many times do you see men that claim to teach woman’s self defense but do not teach the fact that most women do not wear the same types of clothing and footwear when they are out and about on the town or coming and going from work. This is so important as being able to move within your clothing that you wear and is extremely crucial when talking about rear attacks as most women’s clothing are more constrictive and our footwear does not aid in lateral movement. This also goes to men as well who wear dress clothes and shoes while walking into an environment where the traction of those shoes does not aid well, such as a damp or wet concrete parking lot. More than likely the attacker has rubber gripping shoes and you will have to move in your clothing and footwear in that element. You guys also should place on some dress shoes and try this and understand how your body moves in this type of situation. Remember knowledge is very lightweight and you can take it anywhere; remember that. 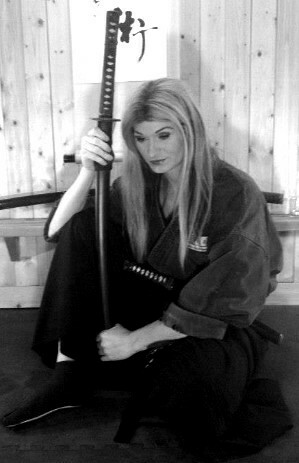 But this article is not for woman’s self defense, or formal footwear; it is for all martial artist of all styles to know and understand that whatever art you are studying, to master it, you have to be able to take all of the kata and apply them from all directions, this is not just knowledge of the arts, this is wisdom within application! I understand that “fights” will come from the front, as the attacker or opponent wants to beat you up. But life and death threats more than likely will not come from the front at all, they will blind side you, come from the rear and not only take all that you have, but take you along with them. If you enjoy looking into your children’s eyes and spending time with you family, than I suggest you do yourself and them a favor and learn how to take any attack from any direction! Hope that this opens doors to all of you martial artist out there; remember there is no art better than another, find the one that you enjoy and the teacher that you trust and you will find the enlightenment that you seek in budo. I wish you all the best, take care, be safe and good luck in your journey of budo!